Google is rolling out a new feature to some of its communication services such as Orkut, iGoogle and Gmail. This new feature has something to do with easily transferring files through the chat facility. If you are an Orkut member or you use iGoogle as a start up page for your browser, you might be aware that both these services have a Google-powered chat facility. And one of the important feature of any chat facility is of course file transfer capability. So, if you want to transfer file to a friend, you don’t have to send them an email again. 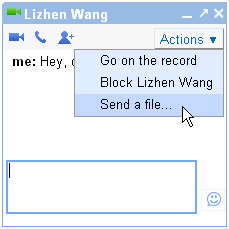 Just start a chat session, click on the “Send a file” option from the Actions menu and then start sending the file. And while you’re either in your Orkut dashboard or iGoogle account, you may have noticed that Google also did some minor facelift to on the chat facility of these two services. More particularly you may have noticed three new blue icons that enable you to start a video, voice or group chat easily and quickly. These new chat features will also be available to Gmail Chat facility . But in the meantime, you can still use the “Video and More” option from the Gmail chat window to start a video conference with your Gmail buddies.